I get along well with all kinds of chili. Beans, no beans, four kinds of beans. Ground meat, chunks of beef. Mild peppers, hot peppers. Spicy hot, little sweet. Onions or not. Bright red or musky maroon. All variations on a theme, a familiar theme, as comforting as your mom’s meatloaf. I thought I was less than persnickety about chili – until I met up with this white chili. And now I’m a convert. A couple years ago, we went to a chili contest, a fund raiser for a local charity. Our friend Susie was competing, and her chili was, as usual, great. (She won the People’s Choice Award.) But there were a hundred pots of chili there, and they were all good. I know because I sampled them all. Some were a little weirder than others. One guy’s secret ingredient was orange juice. Another’s was balsamic vinegar. Some were pretty sweet. Many were fire-breathers. But there wasn’t one white chili among them and I was anxious to taste one before I tried to make some at home. Even though the occasion never presented itself, I was determined to try white chili. It became a minor challenge. So I assigned myself the mission of finding a recipe that might match my fantasy. Instead of going straight to the internet, I went to my ample cookbook library. You’d think there would have been one recipe that would have struck the right chord. But, no! So I resorted to Googling and after several disappointing finds, I landed on The Pioneer Woman’s recipe and I was hooked. (I’ve decided Ree Drummond is the Oprah of the food blogging world.) Her recipe sounded just right: took some effort but was not overly time-consuming. If I was going to do this, it wasn’t going to be a mere unzipping of cans! While I didn’t have everything on hand she’d specified, I had most of it and made a few changes. I didn’t roast a chicken; I bought one at the supermarket. I used cornmeal, not masa. And I added salsa verde and canned pickled jalapenos – because they were in the pantry. And sweet peppers, mostly because I wanted the extra bit of color. Because I'm a fan of white pizza and linguine without a red clam sauce, I was sure I would like it but I was surprised at how much. It was sublime. It smelled heavenly while it was cooking and I wasn’t sure I could wait a whole hour to taste it. Well worth the wait, though. I first made this version of the white chili a few weeks ago when the grandsons (oh, their parents came along, too) visited. We spared the little boys the heat (they loved their applesauce) but the biggie people thoroughly enjoyed the chili, a first for all of us veteran eaters. We had the chili with a new cornbread cracker I found at Aldi’s, a perfect accompaniment. The next time I made it, it was a smaller batch, for a girls’ night in. (We watched the movie “Red,” a pure delight for the 50+ set.) I was also in a bit of hurry and used canned cannellini, and – because I can’t seem to make something exactly the same way twice in a row – I added a can of creamed corn. It did add a different dimension. Mr. Rosemary (see, Mary?) pronounced his leftover helping better than the first batch. Arguable. Soak the beans in 6-8 cups cold water the night before cooking, or use the quick soak method described on the bag of beans. When ready to cook, heat olive oil in Dutch oven on medium high heat and cook onions, sweet peppers and garlic for about two minutes. Add the chilies, salsa, and chopped pickled jalapenos. Add the rinsed beans. Pour chicken broth into pan. Add the fresh sliced jalapeno, seeds, ribs and all. Reduce heat to low and place lid on pot. Cook for one hour before adding the cooked chicken. Then cook another hour or so more, until beans are tender. When they’re tender, mix the cornmeal and milk and add to the chili. Cook an additional 10 minutes, until thickened Check the seasoning and adjust to you preferences of heat, adding more cayenne if you like. Garnishing? Up to you. Monterey Jack cheese, green onion, cilantro, sour cream, all great options. I will now have to add white chili to my bucket list of things to try.I'll bet it was delicious!! I do love white chili - and the grand thing about making chili - is it adapts to all flavors and all tastes. This looks perfect - I've only been to The Pioneer Woman's site once so must check it out again. Wow this sounds so good. I love to go to the Pioneer Woman's site. She always has such great recipes. that sounds like a sure winner, and being from Texas I do love my chili! 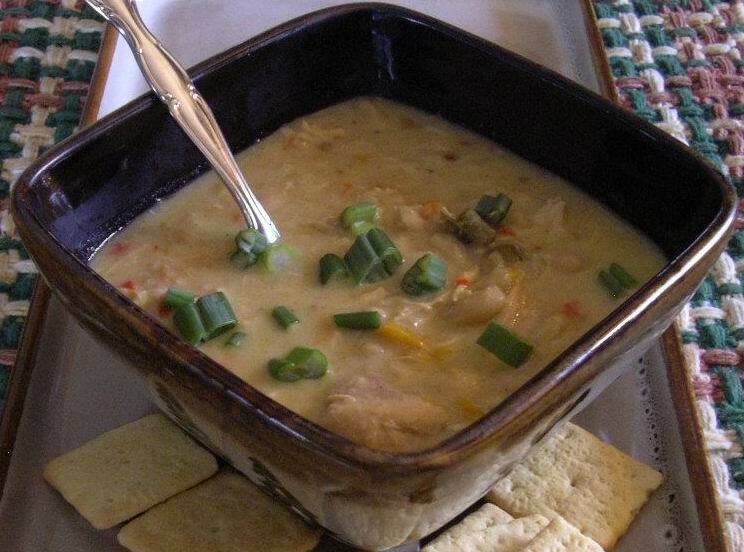 I have never had a white chili and you definitely went to the right person for the recipe! I think I'll try this at school and see what my girls think! White chili is new to me and you made it look and sound absolutely wonderful! I like how you used what you had and adjusted. That happens here all the time too. I'm glad you commented on my blog, I couldn't find you before and I'm happy I did! I do have a recipe for white chili, but I like your version much better. I'm not crazy about tomato sauce so this is my idea of the perfect recipe. Rosemary, this is a totally different version with the chicken, the salsa verde, otherwise all the other spices are the ones I like to add to my chili. I love the way your chili looks, and the flavors, are so inviting. Great Northern beans are a huge favorite of mine, and this is one recipe I would love to try. I love trying other peoples recipes when it comes to making chili. To-date I don't think I have ever made the same chili recipe twice. This one sounds great, pretty sure we haven't had a white chili, thanks. Mr. Rosemary!! Gotta love it :) The chili sounds divine, too. Sounds delicious. I am more comfortable with red chilies, but am always open to new adventures. This dish is definitely one I'd like to try. I have yet to find a perfect white chili recipe...but I'm now eager to try yours out. And I love what you said about the Pioneer woman...so true! Thanks for sharing with me tonight. Visiting your blog brings a smile to my face, week after week. I hope you have a fabulous Wednesday!